Posted by Jeff Hammett in beer reviews, beverages 4 less, russian river brewing co.
Redemption from Russian River Brewing Co. isn’t brewed often, one or twice a year as far as I can tell, but Batch 8 which is on liquor store shelves now is the first batch that has been distributed outside of Northern California. I picked up this bottle at Beverages 4 Less in Santee for about $7.99 for the 12.68oz bottle that comes in at 5.15%. Redemption is the sister beer to our award winning ale, Damnation. Fashioned after a Belgian-style “single”, this ale is rarely brewed in America, let alone Belgium. Typically, “singles” are brewed only at the Trappist Monasteries for the monks to enjoy with meals. They often drink only half of a bottle with lunch and the rest with supper. Robed in a warm golden hue, Redemption is soft on the apalate while finishing smooth and dry. Redemption is refermented in this bottle to create its fine carbonation. The spent yeast form a thin layer of sediment in the bottom of the bottle, adding more complexity and falvor. Pour slowly, allowing the natural yeast sediment to remain in the bottle. I had a small amount of Redemption from a previous batch a few months ago, I had been drinking some hoppier beers before hand when a friend brought out a bottle, so I didn’t have the best grasp on it’s flavor at the time, but I remember it being much sweeter than this batch. With less earthy yeast flavors and not nearly as dry of a finish. According to the bottle log on Russian River’s website that bottle had to have been at least 15 months old when I had it, maybe more. And if it was from Batch 6 or before it would have used a different yeast strain, which could explain the startling difference. 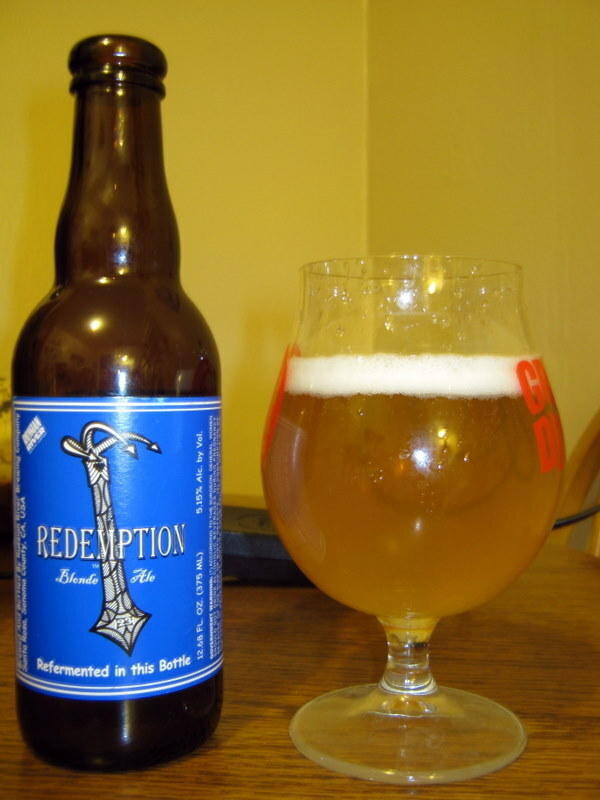 Redemption smelled like earthy Belgian yeast, a bit of a barnyard or hay smell with hints of citrus. The smell was very subtle. The taste was much the same. It started a bit sweet and bready, with a hint of citrus and earthiness but then finished extremely dry. It feels like my mouth has been stripped of all moisture after I swallow. The dry finish causes me to drink faster than I normally would. The finish is so dry I find it unpleasant and it takes away from the rest of the beer. If you can find a bottle (it hit store shelves a few weeks ago) I say give it a try, but I won’t be picking any more up until the next batch.